We are constantly working to support many charities and good causes, well known and some not so well known as our monthly charity collection reflects the generosity of the choir members. 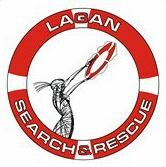 With so many causes needing help, we invite suggestions from within our ranks as to where our efforts may be focused and this spreads financial support as fairly as possible across a wide range of deserving causes. As we enjoy singing we strive to entertain, meet new people, perform with many artists, travel to destinations near and far to promote choral music and in the process gain much needed funds for many charities. 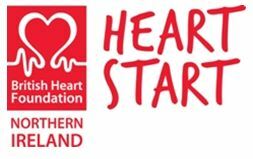 Concerts, church services etc allow for the work to continue as we can support other organisations in their efforts to fund raise for their particular chosen charities and some examples can be seen here along with the choirs chosen recipients. 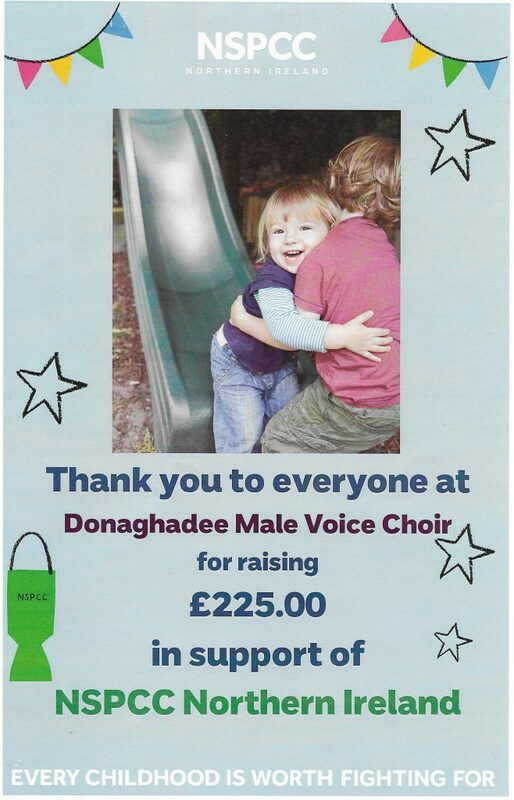 Donaghadee Male Voice Choir was delighted to forward a donation early enough to secure presents for children via this very worthwhile charity and in good time for Christmas. Choir Purchases a ShelterBox for Indonesia. As a result of the recent earthquake and tsunami which hit the Indonesian island of Sulawesi in September 1.5 million people have been affected and hundreds of thousands of survivors are in urgent need of food, water and shelter. 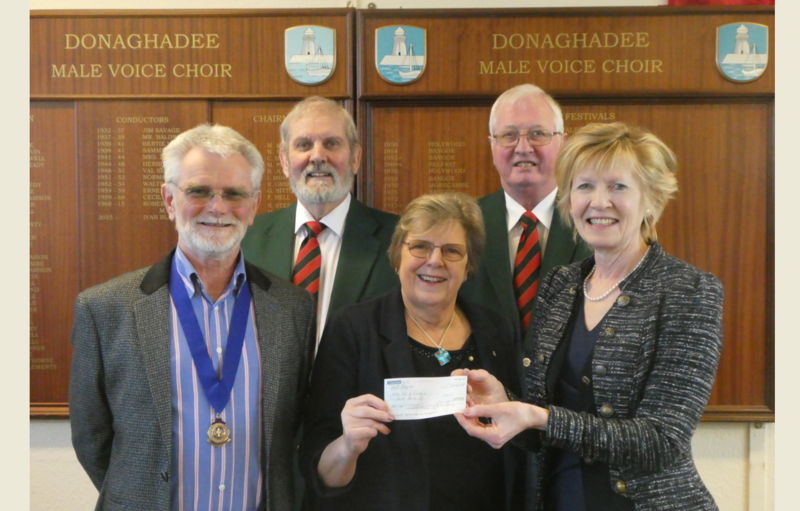 At Donaghadee Male Voice Choir practice last week choir Chairman Richard Montgomery presented Valerie Goodchild, President of Donaghadee Rotary with a cheque for the purchase a ShelterBox as part of the on-going Indonesian Tsunami Appeal. ShelterBoxes are designed to provide temporary shelter and life-saving supplies to displaced families, and typically contains a tent designed to withstand extreme weather conditions, water purification kit, blankets, tools and other necessities to help a family survive. 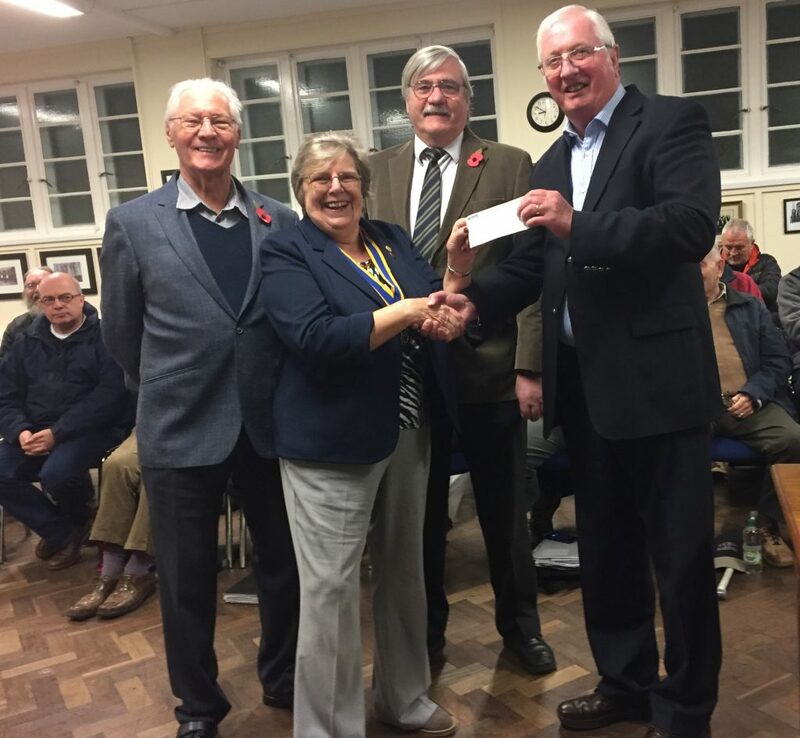 Donaghadee Rotary Club achieved over £2000 this year for Shelterbox. In addition to the choir’s purchase of a shelter box, the main collection was at the Annual Carol Service in Donaghadee 1st Presbyterian Church and a generous donation from a married couple living in Donaghadee. 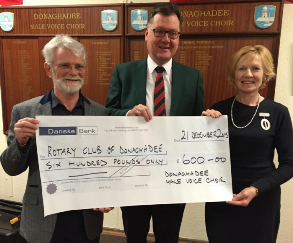 On behalf of the members of Donaghadee Male Voice Choir and as part of its on-going charity work, Choir President Lady Sylvia Hermon and Choir Chairman Mark Mawhinney presented Robert McIlveen, President of Donaghadee Rotary Club with a cheque for the purchase of a ShelterBox. This is the fourth ShelterBox which the choir has purchased. ShelterBoxes are designed to provide temporary shelter and life-saving supplies to displaced families, and typically contains a tent designed to withstand extreme weather conditions, water purification kit, blankets, tools and other necessities to help a family survive. Donaghadee Male Voice Choir took part in a “Big BrewUp” in St Mary’s Church Comber. 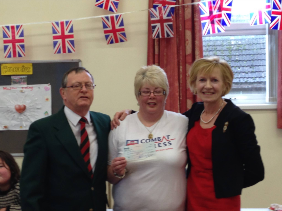 The event was organised by Rosie Day, mother of Corporal Channing Day who was killed in Afghanistan, October 2013. The Big Brew Up is part of the fundraising mission by the Soldiers, Sailors, and Air Force Association and all proceeds from the morning will go to Combat Stress. Combat stress is the UK’s leading charity which specialises in the treatment and support of British Armed Forces Veterans with psychological wounds. Combat stress currently supports over 5,000 veterans aged from 20 to 101. 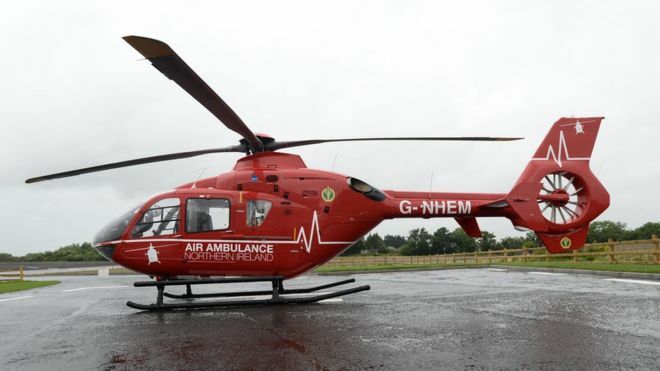 The treatment and support services are always free and are proved to work. After their performance at the Big Brew Up, Lady Hermon MP, President of Donaghadee Male Voice Choir, presented Rosie Day with a cheque from the choir.